G类大作文：School subjects like art, music, creative writing are good for students development. A large part of timetables should be took by school in these subjects , AD. 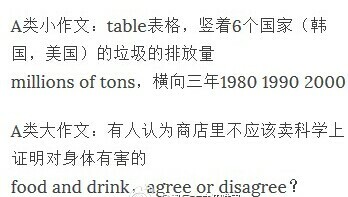 雅思A类小作文表格，大作文Shops should not be allowed to sell any food and drinks which are proved to be scientifically harmful for people's health. Do you agree or disagree? 40. Speakers thinks the main advantage of organic farming is? GMT+8, 2019-4-22 12:08 , Processed in 0.122618 second(s), 29 queries .